The Amy Adina Schulman Memorial Fund is a Princeton, New Jersey based endowment fund providing grants to individuals, young adults who volunteer or intern for progressive social action projects or programs in an area of their interest and commitment. 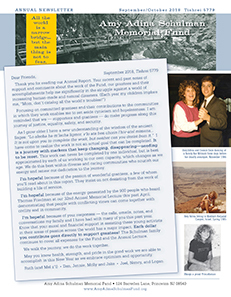 The Amy Adina Fund also sponsors a lecture each year on a relevant and timely topic related to its educational mission. 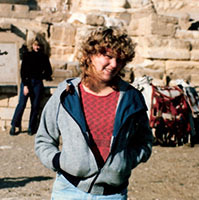 The Amy Adina Schulman Memorial Fund was started in 1987 one year after Amy Adina, 20, died suddenly while a student and activist at Rutgers University. It is a realization of her family and her communities’ desire to celebrate her life, to fulfill her dreams and her potential. Since its inception almost 1,000 grants have been awarded for work in Africa, Asia, Latin America, the Middle East, and the United States—over $550,000 in total. 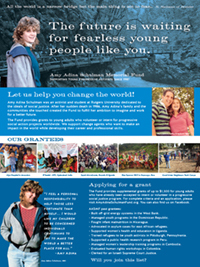 The Amy Adina Schulman Memorial Fund is a 501(c)3 nonprofit organization. "Shifting Sands: US, Israel and the Middle East." 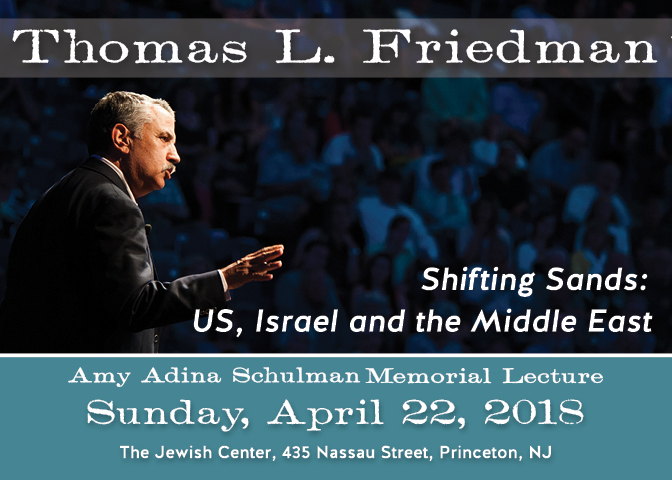 On Sunday, April 22, 2018, Thomas L. Friedman presented the 31st Annual Amy Adina Schulman Memorial Fund Lecture. The lecture took place at The Jewish Center in Princeton, NJ at 4:00 pm. It was a free ticketed event attended by 900+ from the Tri-State area and beyond. Small grants, ranging from $500 to $1500 (depending on length of service), are awarded to as many applicants as possible rather than giving larger amounts to fewer individuals. The number of awards has grown each year thanks to annual contributions as well as to gifts sent to the Fund to honor special occasions and life cycle events. Grants are not awarded for academic programs even if there is a volunteer component. Applicants must volunteer on a full-time basis (30 hours per week) for a progressive social justice program or project and have regular supervision under the direction of an established organization usually for at least 3 months. Applicants submit two letters of recommendation, a letter of acceptance from the organization with which they will work and receive supervision, and also submit a proposed plan as to how they will educate and encourage their peers to participate in the similar social action. Awardees agree to send written reports to the Fund during and upon completion of their project.